Crab Island is one of the most popular destinations in Destin, Florida. With shallow water, excellent views of Okaloosa Island, and lots of fun-loving visitors, it’s no surprise that Crab Island is a top choice for visitors in search of a great time in Florida. While you might know that you want to visit Crab Island, deciding how to get there can be a tricky question. While there are plenty of options, a double-decker pontoon boat—with double slides to boot— is the best kept secret for all-day fun and a stylish arrival. There are some ways to get to Crab Island that might seem convenient, but aren't ideal for a group. A kayak or a paddleboard can be the cheapest option, but not if a group of 10 or more all need to rent their own equipment. If you're planning to visit Crab Island with your entire family, or you're exploring the Choctawhatchee Bay with a group of friends, then there is just one option that reigns supreme: The pontoon boat with two decks! 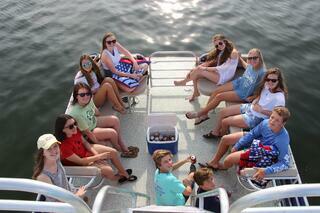 A double-decker pontoon boat can hold a surprising number of passengers. With capacity for 20 adults, these boats are a fantastic way to keep the group together the entire day. Selecting the best pontoon rentals Destin has to offer means that you'll be able to hang with your nearest and dearest without the hassle of trying to keep multiple kayaks or boards together or renting multiple smaller pontoons. Arriving in style to Crab Island is just one reason that renting a double-decker pontoon boat is such a popular option. Their popularity also has a lot to do with their ability to help you stay all day at Crab Island. If you get to Crab Island on a small, unshaded vessel like a kayak, it can be difficult to spend a full day there. After a few hours, the direct sunlight might get to be too much, and you won't be able to take advantage of all Crab Island has to offer. Opting for a pontoon rental allows you to conveniently store your own food, drinks, snorkeling equipment, life jackets, and fishing supplies, plus escape from the sun when it gets to be too much. All of this means you can spend the full day kicking back and soaking up the fun and sun at Crab Island. Once you've arrived in style to Crab Island, what comes next? If you’ve rented the right double-decker pontoon, you’ve got built-in fun and entertainment in addition to everything Crab Island itself provides. The best pontoon boats have two decks and two slides! They also have built-in Bluetooth so you can enjoy your favorite tunes. They have plenty of room for coolers, rafts, toys, and more. A pontoon boat with two decks gives you more options for spotting dolphins, admiring the scenery, and listening to music. The two water-powered slides are guaranteed to be a huge hit with everyone on board. The right pontoon simply adds to the great experience awaiting you at Crab Island. If style, comfort, fun, and safety are your objectives for a day at Crab Island, then you need to rent a double-decker pontoon boat from Double Fun Watersports. The cat is out of the bag that Double Fun Watersports has the best double-decker pontoons in Destin and the experience needed to get you to Crab Island in style. Contact Double Fun Watersports to find out more information!